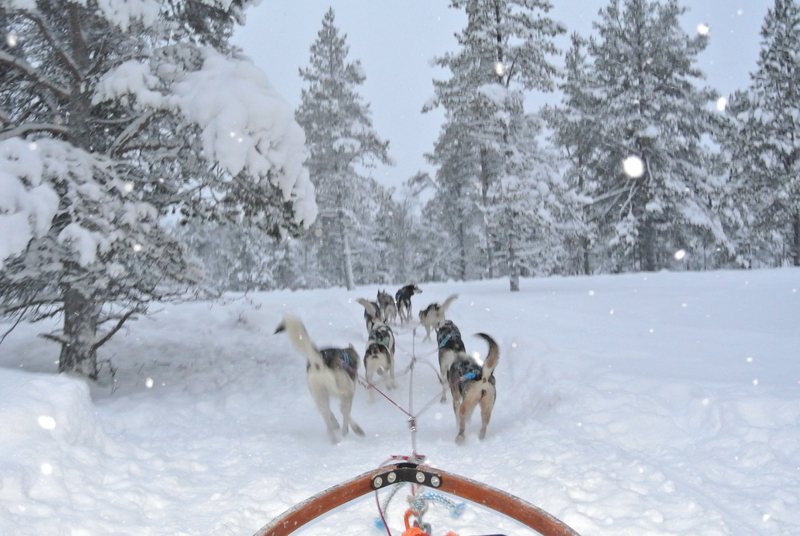 You are here: Home » Husky Racing in Lapland! Siberian Husky (along with Alaskan Malamute, Greenland dogs and Samoyeds) is a recognised breed (and can therefore be registered), while Alaskan Husky is not recognised as a distinct breed and the term is often used more generally to describe dogs suitable for and used in dog sledding. Alaskan Huskies can therefore be quite varied in terms of their size, build, colouring, etc. Alaskan Huskies are shorter haired and run faster than their prettier Siberian Husky cousins, which are the fluffier, prettier show dogs who run slower. The characteristics that make a good show dog are not necessarily the same as those which make a good working sled dog. Working dogs are bred and selected for qualities such as tolerance to low temperatures, stamina, good metabolism, strong paws, ease of training and (one of the most important qualities) sociability, both with other dogs and with humans. Show qualities are therefore not prioritised in the selecting and breeding of working huskies and the dogs most successful in competition sledding will almost never been completely “pure-bred”.Most of the dogs we saw at the Husky farm were not pure bread, as they are working dogs. We were warned that the dogs would not be as fast on our day as they would be in ideal conditions, as it was a balmy -10°C, and the dogs prefer temperatures of -25°C for racing! …They are bread for living outside, and as such, these dogs are never sold or given away. Only staff and ex-employees or well-known locals are allowed to own retired dogs, as they do not want the dogs to end up in apartments or in a country where it is too warm for them. These dogs can run approximately 100km per day if trained. There is a famous husky race called 1000 Miles, which takes place in Alaska every February which is completed by the fastest team in under 10 days, and they reach speeds of up-to 40km per hour when temperatures are cool enough for them. The huskies at this farm don’t run anything like these speeds or distances, since they do far more stopping and starting, and need to be rested between. They ran an average of 30-40km per day, with the team training the dogs from April-November and tourism accounting for the dogs exercise for the rest of the year. Working huskies at the farm retire after 8 years of running, though the older retired dogs are often used to help train the puppies and are re-homed locally. The dogs clearly LOVE what they do and get very excitable before a run. On our taster day, dogs that were being rested were clearly itching to run, and were calling, howling and woofing excitedly to one another. It was very cute to watch! Like people, not all dogs get along with one another. Some dislike one another intensely and will fight a lot. We were warned not to attempt to overtake other husky teams or get too close incase the dogs fought, as teams are selected carefully with this in mind. When the teams are put together, there is a strategy to the position of the dogs, the order within the team pack is not random. The teams average 6-8 dogs, with the 2 fastest and most clever dogs leading the pack at the front, the next fastest behind them, and at the back, are the strongest and most powerful dogs. Often the less intelligent dogs (since they need no pack-leadership skills). We were lucky enough to be allowed to go to the puppy enclosure to pet the puppies that were currently being trained. At 4-6 months old, they weren’t exactly tiny, but we were warned not to let any loose items dangle, or to take anything too precious in, as the puppies were incredibly playful and naughty (in the cutest way) and would rip things apart quite easily… I had to launch my spare mittens over the wire enclosure from inside; as whilst I was petting one of these gorgeous pups, 2 of his cheeky friends came and tried to nip them away. This photo makes me giggle every time I look at it because the puppy I am petting is licking my face and the other 2 are busy trying to pinch a glove each! Playful Alaskan Husky Puppies – One Licking my face, the others stealing my mittens! In the Arctic Circle, the sun never technically rises in the winter; so you only get about 2-3 hours of dim light in the middle of the day, and the rest of the time it was dark. As such, any pictures in this blog entry that aren’t taken in darkness are from the taster day, not from the husky farm. On the husky trip day, we weren’t collected until about 3pm, when the last of the dim-light had already disappeared. The only light at the husky farm came from bulbs, and since we were driving the huskies through the forest it meant that we were doing so most of the time in pitch black, which didn’t offer us the best chance to enjoy what was a hugely expensive, and wonderful experience. This is why you won’t see any video’s of us driving the sledge during this experience. Book ASAP – We were advised to book up at the earliest opportunity since this is always one of the first experiences to sell out. We booked immediately after the welcome meeting, and I’m glad we did, because it was sold out before the taster day ride-despite the MASSIVE price tag-we paid 135€ EACH for adults and I think somewhere in the region of 85€ for our daughter! You will get a chance to drive the sled, if there are 2 of you, you can both have a turn. Do pet them afterwards if you want – they will be contented and relaxed and happy to be stroked – but do prepare to smell very ‘doggy’ afterwards. Dont let the sledge get too close to the rear dogs as you can damage their legs and send them into a long period of miserable recovery where they can’t get their usual excercise. 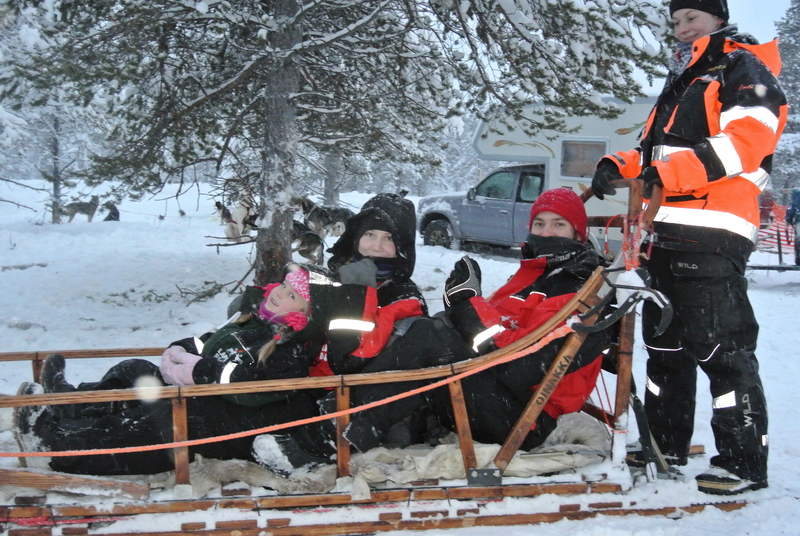 ← Longest Toboggan run in Lapland! I just got back from an aurora-chasing trip to Finland myself and did this Husky sledding activity. The information that you provided sound really similar to what I learnt. Am wondering if you used the Husky Co? Keep it up with the wonderful posts!